Key to the design operation of the AGVs (Automated guided vehicles) are the modular MELSEC L series PLCs from Mitsubishi Electric. Every MELSEC L series PLC CPU provides 24 I/Os, a 2-channel high speed counter, 2-axis positioning, pulse catch and interrupt functions. Engine block assembly is a sophisticated process that brings together a number of complex and often heavy components for a mixture of manual and robot assembly processes. The competitive nature of the automotive industry means that manufacturers are continually striving to drive up productivity and economy whilst optimising logistics and, of course, minimising floor space requirements. To address these stringent requirements one leading Asian automotive manufacturer has implemented an advanced handling system using 130 AGVs to move components between robot stations, special purpose machines and manual workstations. 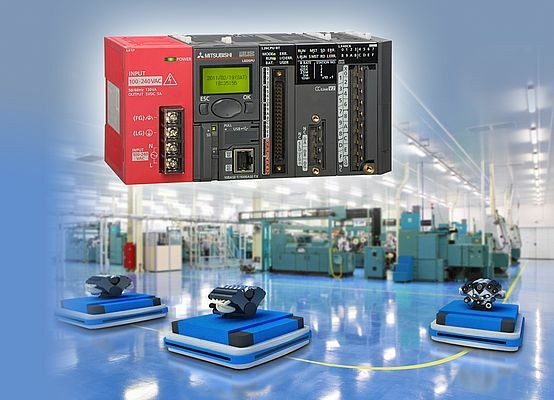 The use of AGVs has helped to optimise the plant configuration and set new standards for productivity. At the start of the engine block assembly process, the engine block - after machining and cleaning - is transferred to the assembly line. The bearings on which the crankshaft will turn are installed and lubricated. Next the crankshaft is lowered into the position. After that, pistons are installed into the cylinder bores of the engine block. A steel connecting rod attaches each piston to the crankshaft. Then the back of the engine block is closed up with the rear cover. On another line, the engine block head cover is manufactured. Spark plug tubes are inserted into the heads. The heads cap off the cylinder bores, and provide each cylinder with a spark plug and valves. The engine block head cover is assembled onto the engine block, and a cover is bolted onto the front of the engine, the head and the timing chain or belt. The chain/belt connects the crankshaft to the camshaft so that they rotate in unison, ensuring the valves open when the pistons are in position. It can be seen, then, that the AGVs are critical to the smooth running of the engine block assembly line. For an effective and reliable solution, the automotive manufacturer needed AGVs that would be capable of transporting the heavy components, yet be highly compact. They also had to be easy to set-up, install and operate, and had to communicate with the plant's higher level control system over a wireless LAN. The solution was a newly developed line of AGVs. Featuring Mitsubishi Electric's MELSEC L Series PLCs and GOT series HMIs, these towing AGVs represent the state-of-the-art in automated handling. 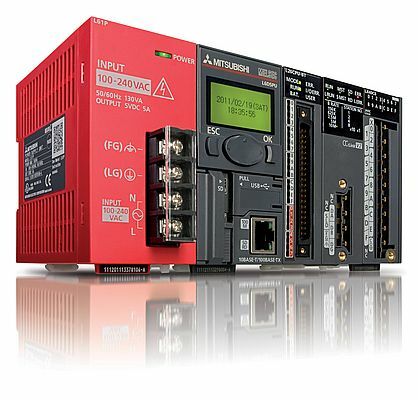 The MELSEC L Series is Mitsubishi Electric's newest PLC, designed to meet the needs of OEMs by providing all the performance, functions and capabilities required for today's demanding automation requirements in a compact, rack-free package. Bridging the gap between the FX micro PLC and the iQ platform high performance modular MELSEC system Q Series PLC, the new modular controller puts all the power of a Q series PLC into a small PLC, greatly increasing the range of functionality traditionally associated with PLCs of this size, with ease of expansion and a user-centric design inspired by the FX. All the features and functions that are needed for the most sophisticated of machine automation projects are built into the MELSEC L Series PLC CPU as standard, minimising hardware and engineering costs, and ensuring the highest levels of flexibility. Every MELSEC L series PLC CPU provides 24 I/Os, a 2-channel high speed counter, 2-axis positioning, pulse catch and interrupt functions. The built-in communications options include an Ethernet port, providing a simple interface to higher level control systems. All of this made the MELSEC L Series PLCs ideal for the control heart of the AGVs. The compact, rack-free package enabled the control panel size to be reduced, whilst having all the required functionality built into the CPU as standard simplified set-up. Some 130 of these AGVs now move the various engine block components from station to station around the automotive manufacturer's assembly line. With built-in Ethernet, all that was required for the PLC to communicate with the plant's control system was a wireless LAN adapter. Receiving instructions from external I/O, the PLC calculates all parameters and controls the AGV around the plant, safely and reliably. With the automotive industry characterised by competition on a global scale, the goal in all areas of manufacture is zero defect production, which demands optimised logistics combined with highly efficient assembly operations. With Mitsubishi Electric's MELSEC L Series PLCs at their heart, these newly installed AGVs are making an important contribution, helping one of the world's best known automotive manufacturers stay at the forefront of engine manufacture.